U.S. markets are sitting near record-setting levels, but investors seem reluctant to push on into uncharted territory. 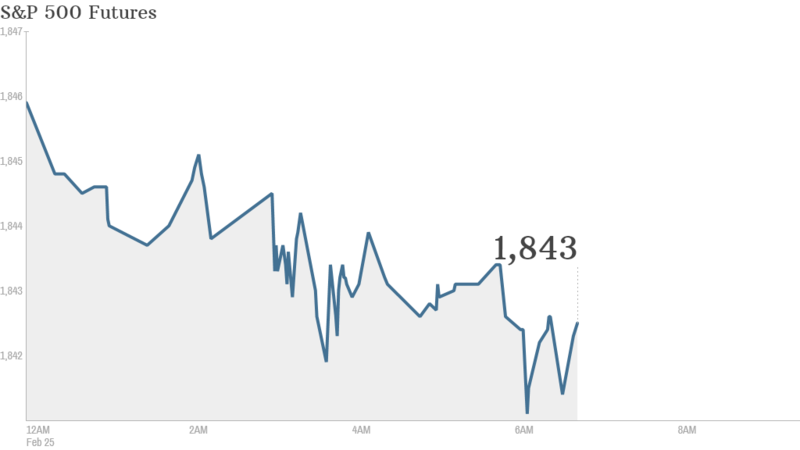 U.S. stock futures were edging lower Tuesday morning ahead of the opening bell. U.S. stocks made big gains Monday, and the S&P 500 surged to a record high before pulling back slightly. The Dow Jones industrial average added just over 105 points and the Nasdaq also closed higher. "The fact yesterday that we pulled back from the highs, probably indicates that the market has to build a base around these higher levels before we can see any more movement to the upside," said Peter Cardillo, chief market strategist at Rockwell Global Capital. "The market will have to continue to trade around these present levels." Looking ahead to Tuesday, investors will get to review new home price data from the Case-Shiller index at 9 a.m. ET and the Conference Board will release its monthly consumer confidence measure at 10 a.m. ET. In corporate news, Macy's (M) will release earnings before the open. T-Mobile (TMUS) shares dropped because of the telecom's widening quarterly loss, despite strong revenue and the addition of more customers. Home Depot (HD) shares gained after the retailer said that a recovering housing market drove an increase in quarterly sales. Shares in BlackBerry (BBRY) could also get a lift when the opening bell rings. There is a report that the company's technology could be used in Ford (F) cars to connect vehicles to drivers' smartphones. The firearms company Sturm Ruger (RGR) is set to report results after the close. Solar City (SCTY) shares slid after the closing bell Monday when the company postponed its earnings results until March 3, citing "accounting related to recent acquisitions." It was slated to report Tuesday evening. Investors are also looking ahead to testimony from Federal Reserve chair Janet Yellen on Thursday. Yellen told lawmakers earlier this month that the Fed will continue to taper its bond buying program this year, but she stressed the need to keep interest rates low for a long time. European markets were declining in midday trading. Asian markets posted mixed results. The Shanghai composite tumbled 2% while the Nikkei in Japan advanced 1.4%.